I apologise for the mixed tenses. 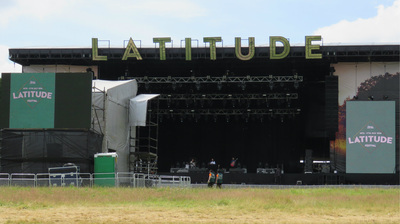 I have been a bit disorganised, not to say distracted in my preparations for the Latitude Festival. It has loomed, but although my festival kit has been brought down from the loft, I have neither sorted through nor checked. Even my routine tent check had to be called off due to weather and commitments the previous weekend. I had decided against the “Green” option this time and opted to drive the 130 or so miles from home to Henham Park near Southwold in Suffolk. After loading the car, and charging the automatic cat feeders I left home at about 10:15 on Thursday, planning to arrive just before the campsite opening time of 14:00. M25 traffic stopped just before the Dartford River Crossing, and there was a minor delay near Ipswich, but I parked up in the Weekend Campers Car Park at 13:50. Planning to put my tent up and ten come back to the car for my clothes, snacks etc turned into an epic fail with the announcement that all alcohol must be taken through to the site when you are given your wrist band after exchanging your ticket. This meant my retracing to the car with a hired trolley (£10 for 90 minutes and a £50 deposit). Formalities done, I found a spot quite close to the exit to the Car Park which should be quiet enough to let me get a few hours sleep each night. The tent went up easily, even with the pole elastic having lost it’s bounce, I stashed my kit. After buying the 2cm thick Festival programme for £10 (the only way to get a copy of a physical copy of map or stage schedule for the numerous stages), I had a chance to have a wander and find my bearings a little. Initially the site layout felt a bit confusing and not in tune with the map, but I eventually deduced that there is a three path triangle around the campsite, from which most areas were accessed. The key was a treed path called “Hollow Tree Road” which leads from the camping are to “The Village” and it’s various food and trinket emporiums and on to the Lake and Arena areas. I was camped in the eastern part of the Henham Park site and essentially needed to head to the western side which is “where the fun happens”. Security started to check punters bags and open the entrance to the Lake and Venue areas shortly after 18:00. 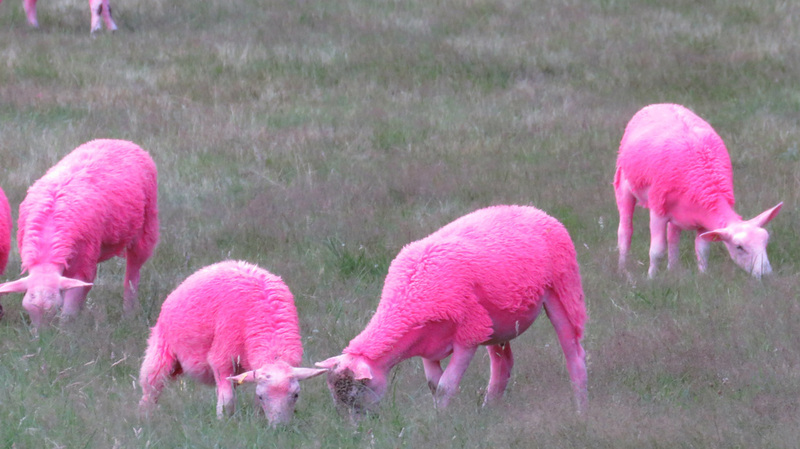 I had my first sighting of the Latitude trademark Pink Sheep, which were quite oblivious to the attention being lavished on them! The sheep are down by the lake which is skirted by trees and the landscape is really nicely set. Over the bridge to the other side where there is a cocktail bar and ‘local’ food stalls, and carts being plied in the Secret Emporium marquee. I found two stands selling beautiful but truly impractical hats. The first was a company called “Animalesque”, who hand crafted animal themed hats and there was a very striking one in the form of a Kingfisher head. The other had hand crafted very bold coloured hats embellished with feathers. I satisfied myself by taking a couple of photos, even though if I had been in a weaker frame of mind I would have bought one. After this, I ambled around taking a few photos and had some dinner. This was a wholesome Paella with chicken and chorizo (£7) with home style lemonade. As the evening went on, I began to feel a bit chilly so went back to my tent for a fleece, but returned to the Arena area via the Security checks. This time I had to explain that the Canon SX60HS I had in my bag did fulfil the festival’s photo equipment guideline because the lens was non detachable and that it is classed as a Bridge Camera. I joined the crowd in the Literature Tent to see The Horn Section who were very funny people. On the way back to the campsite, I saw a couple of nice laser shows by the lake. Here is a short phone video I took on the way home to my tent. I got back to my tent and settled down by about 23:30. Strolling towards The Village to see what breakfast choices were being offered, a couple of young girls asked if I could check their cooker as they couldn’t get it working. As it happened, the gas had lit but they couldn’t see the flame because of the bright sun. After that a potter and taking a little time to watch the world go by – Emmy the Great was due on the Obelisk Stage at 12:30, also pencilled in are Weaves, Courtney Barnett and British Sea Power among others, but there would be time to see what else the first day proper of the festival brought my way. Friday morning’s question : Is the face paint and glitter I am seeing on so many people’s faces at 08:45 fresh on today or has it been in place all night? The toilets were very unsavoury this morning already, so I succumbed to the “advantage” of premium rate toilets (“Seat of Luxury”) for a £30 fee. A wise choice, I feel. I chilled and wrote up yesterday’s notes with a bottle of Lipton’s Lemon Tea. At about 11:30, I ventured towards the Arena area and had to queue for the security checks, but was told that my opened reused water bottles would have to be emptied, drunk or thrown away before entering that end of the site. It seemed crazy, but the organisers did not want any alcohol being taken through from the “camping” side. They are happy to sell it to you when you are on the other side, but you can’t take it in !! 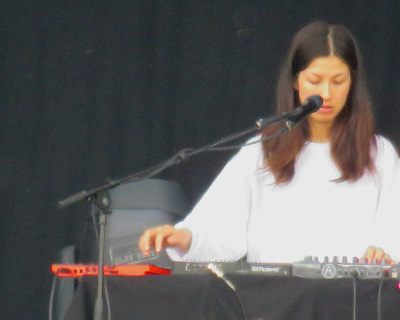 The Obelisk Arena was closed with tape, but I saw Emmy the Great doing her soundcheck. 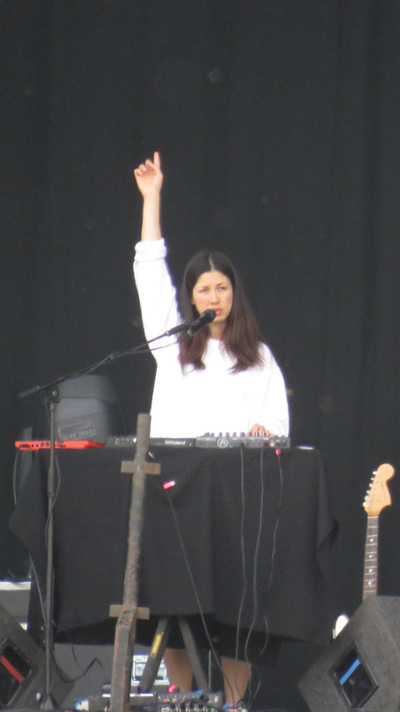 Although the Production Team was running a little late, Emmy the Great kicked the main event off at 12:30. She played a good set of newer songs with just a couple of favourites in the mix. Referring to the latest phone app sensation Pokeman Go!”, Emmy asked the audience to let them know if anyone saw a Pokeman on the stage with them. After her set, I went in search of lunch and settled on a Saag Paneer with rice and naan for £7. Pretty tasty. Next stop was up in the trees above the lake at the Sunrise Stage. The stage itself was well hidden, and Weaves were playing when I got there. The singers voice and guitar sound work very well. When I left the stage area and began making my way down to the BBC Radio 6 Music stage, I bumped into Neale, who works at Canon UK, and we chatted a little. We walked down the hill and I left him and his friends going towards the lake for a swim. On the BBC Radio 6 Stage, Oh Wonder came on and served up a nice bit of pop. I had only heard their name, not their music and they seem to be a solid pop band, who seemed genuinely pleased to be there. A short stroll to the Obelisk Stage saw British Sea Power in full flow. I had seen them at the Mumford and Sons curated Gentlemen of The Road event in Lewes in 2013. They are a band with a very big sound, I like them but don’t actually own any of their music. It was good to see that their Black and White mascot bears still make an appearance dancing in the audience. The sun was bright and I had to put on a few helpings of sunscreen, but I think some got into my right eye and caused a lot of discomfort despite washing it out with water several times. I stayed at the Obelisk, this time on the rail and saw another good set from my favourite Cortney Barnett. As always, she delivered a good rocking set with her band (“CB3”). Courtney is always business like, few words between songs, but she is a class act. I went for a change of pace after leaving the Obelisk and went to the nearby Film Arena for a David Bowie tribute from comedian Adam Buxton. It was both fond and funny and was very enjoyable. And I did shed a big tear during a video compilation set to “Heroes”. As the temperature dropped, my right eye watered and I went back to my tent for a fleece. My head was aching a bit as well, which may have been due to slight dehydration. I would have to take care tomorrow. I made one final visit to the Obelisk to see the Macabees. Again, I knew the name, but not the music. All in all, it was a good noise. I got back to my tent and turned in at about 23:30. I was very tired, but it had been a fantastic day. My ‘plan’ was for a leisurely day, but I woke at 05:45 and was up by 07:15. I took a few bits back to the car and went to find breakfast (Full English £7) and a cuppa tea. An additional bottle of Fanta and water might help with the dehydration issues. The sun was shining gain and I strolled towards the Village and Arena areas and checked the various emporia and took a few photos. At about 12:00, I decided that some lunch was in order. Macaroni Cheese, topped with mushroom and truffle oil did the job at £8. Music was drifting from the Obelisk Stage so strolled a little farther and caught the end of an Asian sounding band’s set. Alif, it turns out originate from Pakistan and were quite enjoyable. After they had left the stage, I hung around on the rail once again and a group from the United States called Sturgill Simpson blew me away playing good, honest foot-stomping tunes. Next up was another band I had seen the name of, but not heard their music – Nathaniel Rateliffe and the Night Sweats. They came up with another very good foot-stomping set with guitars, keyboards and percussionists. Annoyingly, my right eye was beginning to weep and get painful again and was bothering me. I stuck with my good front row spot for another crowd pleasing set from Squeeze. They played hit after hit and were very warmly received. I took the opportunity during the break in my schedule to go for some assistance in the First Aid tent. I asked them if they could look at my eye which was really causing me some grief. Some eye drops and eye rolling told them that there was no scratch or foreign bodies in my eye. This was a relief and they suggested that some sun screen had irritated it and that I should keep washing it out as often as possible. I should essentially “Man-Up”. After thanking them, I went up the hill to the Sunrise Stage to see another band whose name I had heard – Teleman. They were fine, but I noticed that Peluche were playing a set at the Alcove. I had seen them supporting Summer Camp at a gig last year. Peluche have and interesting sound, but as I thought last year are not really for my taste. I was very tired at this point, so decided to rest by the lake. I ate a very nice lamb, mint and chilli burger (£7) and another bottle of 7up. I had planned to go back to the Obelisk to see Chvrches and then the National, but I was just too tired to handle it – maybe old age or the very hot and humid day were taking their toll on me. Comedian Mark Watson was doing a “book thing” in the Literature Tent, this was very funny (not the book reading part, which was actually a murder mystery novel. The session turned into a an informal stand-up comedy routine and was very enjoyable. Marcus Bridstock, the satirist was up next with something billed as “Prince Fest”. I thought is would be a relective look back on Prince’s career. It turned out to be a full-blown party celebrating the artist’s work. Guests and crowd sang along for just over an hour to the Prince back catalogue. And yes, I had tears during the Purple Rain finale. Rain overnight and noisy neighbours and passers by meant that I had a very disturbed sleep, but managed to doze until 06:50, but I was up by 07:15. A Full English Breakfast (£7) and a couple of cups of tea eased me into the day. While visiting the “Seat of Excellence”, I noticed that my face and cheek was seriously discoloured by the dye that the first aiders had put in my eye. Luckily the use of glitter and face paint around the festival meant that it did not actually look out of place. A proper face wash sorted that out..
After breakfast, I packed away all the “non-essentials” in my tent. Then I strolled towards the Village and Arena areas and took a last look at the lovely hats in the Secret Emporium. Strolling towards the Comedy Tent, I caught the end of David O’Doherty’s set, which I thought was pretty funny and a pint of cider went down well. Mark Watson was due on at 13:00, so I made my way into the tent between acts and made myself comfortable in my legless chair. The MC introduced American comedian Jen Kirkland, who I had not heard before. Her observations are quite cutting but funny. Mark Watson was on next and was as funny as I expected. His style is slightly ram-shackle and has a shambolic technique which I really like. After this show, I ate a Cheese and Onion Toastie (£5) and a drink. I traversed the hill towards the Obelisk arenas and caught the end of a triumphant sounding set from Columbian band, Sidestepper. The stage was reset for Michael Kiwanuka, who in truth was terrific. Laura Mvula followed and was also very impressive. At this point it was about 16:45 and to be frank, I was feeling more than a little jaded. I had after all had two bad nights on the bounce. I had enjoyed the weekend immensely, but wondered if I should really hang about until 22:00 for Of Monsters and Men. I decided that “enough was enough” and that the prudent thing to do would be to pack up my tent and go home. Which is precisely what I did and was home by 22:45. Latitude 2016 had been a really good festival for me and had maintained my interest with it’s varied music, arts and performance aspects in the programme. And yes, I would go again. I have taken these photos at the gig and may be watermarked.